It has been confirmed that Conan: Exiles will support mods at launch, with the game's creators releasing a custom Unreal Engine editor that is designed to allow modders to create content for the game with ease. Modders will be able to host modded game servers and make their mods available to everyone through the Steam workshop, allowing PC gamers to easily distribute and install game mods. Conan Exiles will feature full mod support on PC. This is planned to be available from the start of Early Access. Mod developers will be able to download a custom Unreal Engine editor, letting them create a whole host of modifications to the game. Everything from changing aspects of gameplay to adding new monsters and items to the game can be done with the modding tools. A mod management tool which connects to the Steam Workshop allows players to easily load in the mods they want to play with. More information on the mod system and tools will be revealed soon. Owners of Conan Exiles will be able to host their own game servers from day 1, which will be immune from server wipes throughout the game's development on Early Access. Private servers are where players can modify and alter the gameplay experience to their own specifications, adjusting various settings to their liking. Setting up a private server is incredibly easy. A copy of Conan Exiles purchased through Steam comes packaged with a dedicated server tool. Once the game exists in your library you can install a private server on any machine from Steam. Head to your Steam library, go to the tools menu and find Conan Exiles. From there you can install your private Conan Exiles server and set it up. 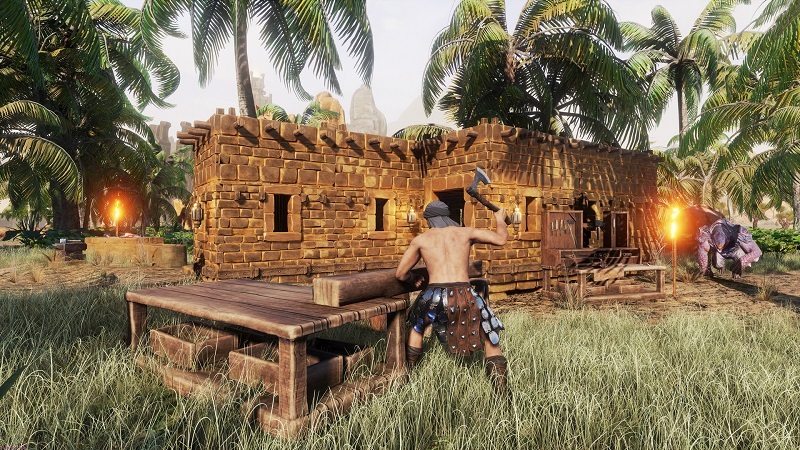 Conan Exiles will allow players to play in a huge world, where the player must keep himself fed and hydrated through deserts, tropical forest and towering ruins. Players will be able to build settlements and even cities, all while fighting the many monsters that inhabit the world. Below are the full PC system requirements for the early access version of Conan Exiles. Conan Exiles will release on Steam in Early Access on January 31st. You can join the discussion on Conan Exiles on the OC3D Forums.